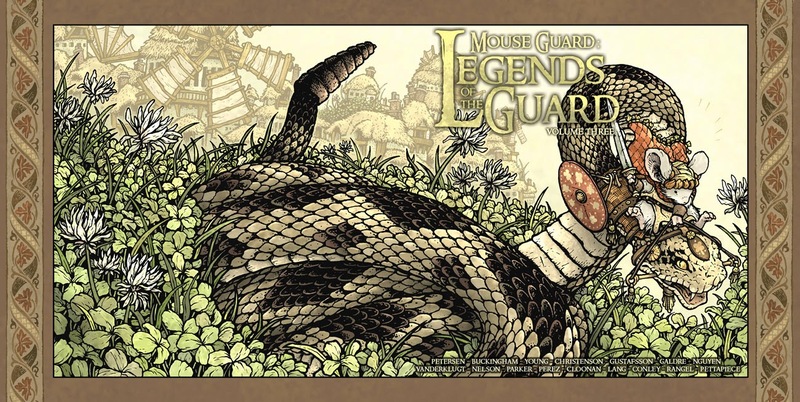 The third Legends of the Guard Volume will be collected in hardcover later this year. Like all Legends of the Guard cover, the images are Legends themselves. To the left you can see the cover as it will appear on the book, but for today's blogpost I'll go over the process to get there. I started with the idea of the Legend, which was a story seed I'd jotted down (with about 5 others) for contributors who needed some ideas to get them started. 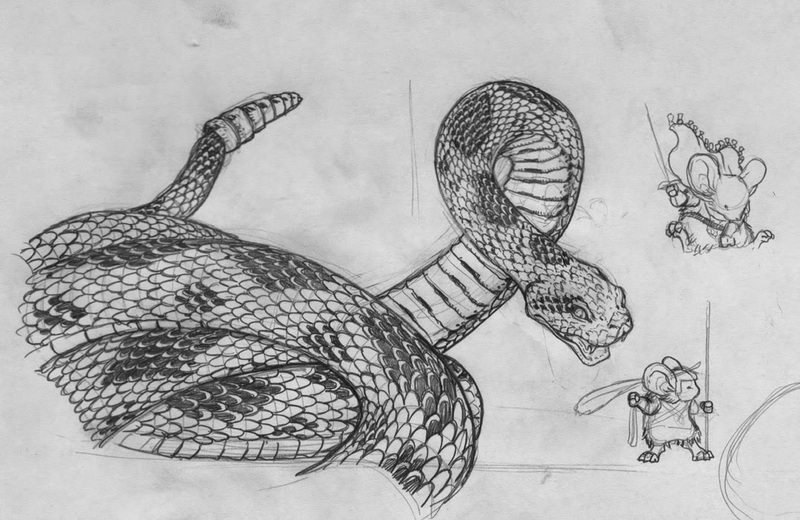 A story about a mouse who rode a snake as a mount had never been claimed, so I used it for myself. 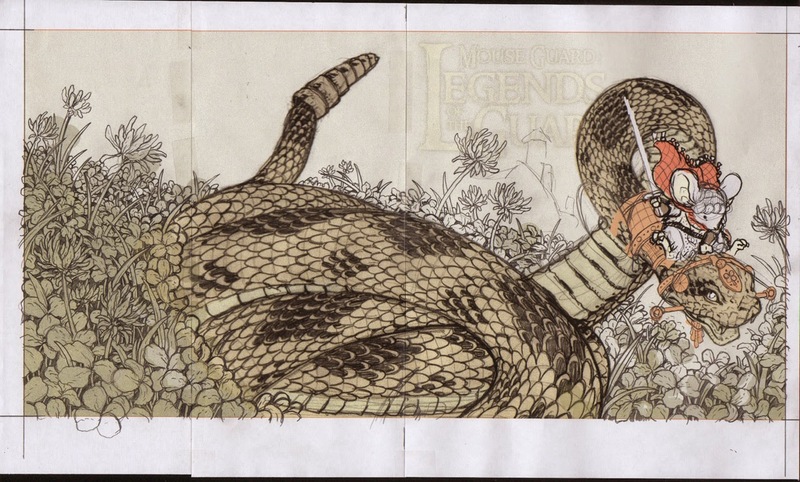 The snake and mouse were drawn on copy paper for me to scan to resize and place in a cover template file to make sure everything fit with logos, spine location, etc. After I composited the subjects and digitally painted in some color to help establish the horizon line, I printed out the layout (on several sheets of printer paper and then aligned them and taped them together.) 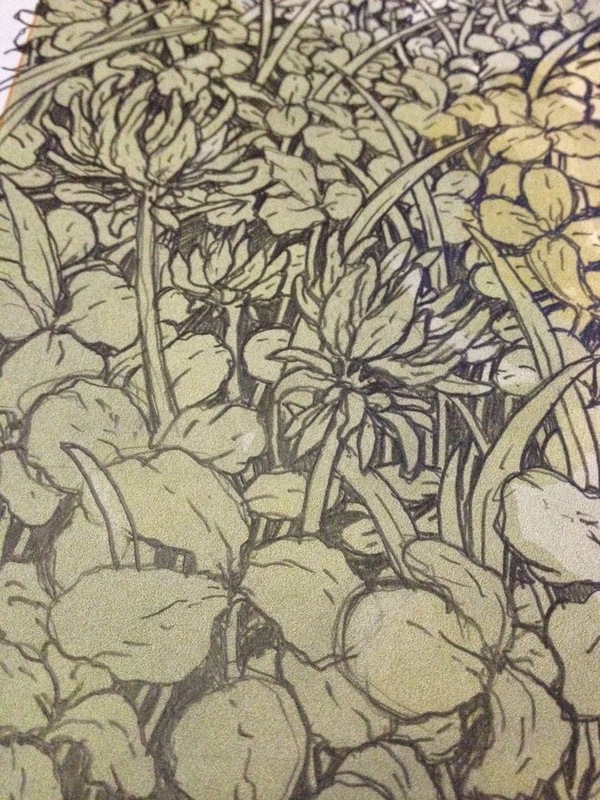 On the printout I started penciling in all the clover and grasses that would make up most of the landscape of this cover. Here you can see my pencils on the printout. This is something that looks very detailed and chaotic, but since it's organic repetition of shapes, it's not as complex as it appears. I just keep doodling the same shapes over and over overlapping some, filling in gaps with back, and drawing a blade of grass or a clover flower popping up very so often to break the monotony of shape. The only downside with this was that I so tightly penciled the clover that there was less to do in the inking step and it made me feel like I'd lost some of the life and detail in my pencils. After adding in the clover on the printout, I decided I needed more background...the sky was missing something. So I went with a mouse city. For inspiration I looked to James Gurney's painting for Dinotopia: Journey to Chandara of the Windmill Village. I drew my mousey dwellings on copy paper aligning them to the printout on my lightbox to make sure I was drawing the buildings only in the open spaces. With the various printouts and sketches taped to the back of Strathmore 300 series bristol at different times, I was able to ink the cover on my lighbox. 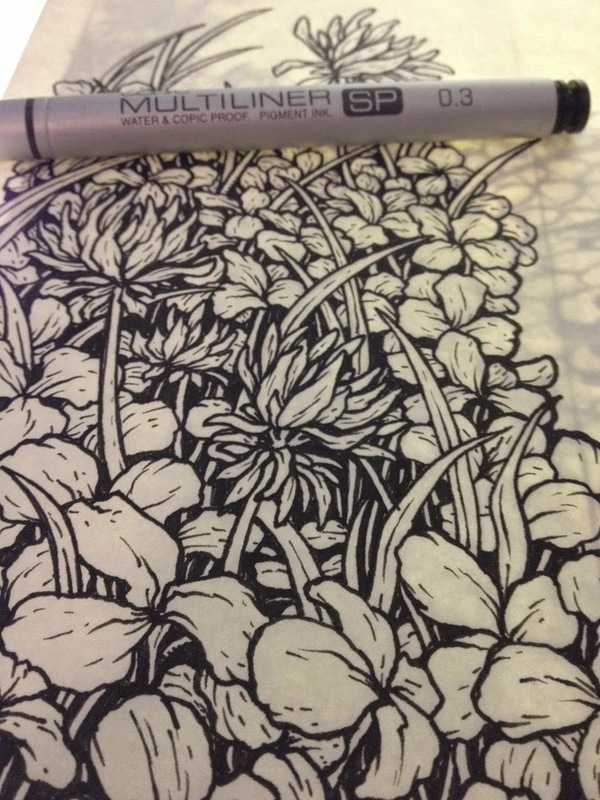 I used Copic Multiliners to ink with. I prefer the 0.7 nib for most of my lines, but I drop down to the 0.3 or 0.2 for really fine details or lines like the mouse's eye. 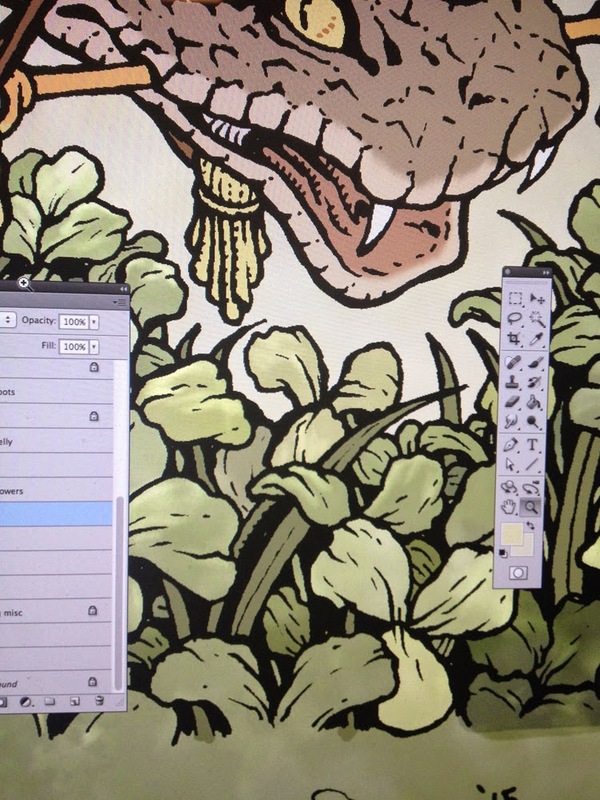 Below are some process shots I took with my phone and shared on Facebook, Instagram, and Twitter as I inked. After I finished the inks I scanned them in and started to color the piece with flat color in Photoshop. 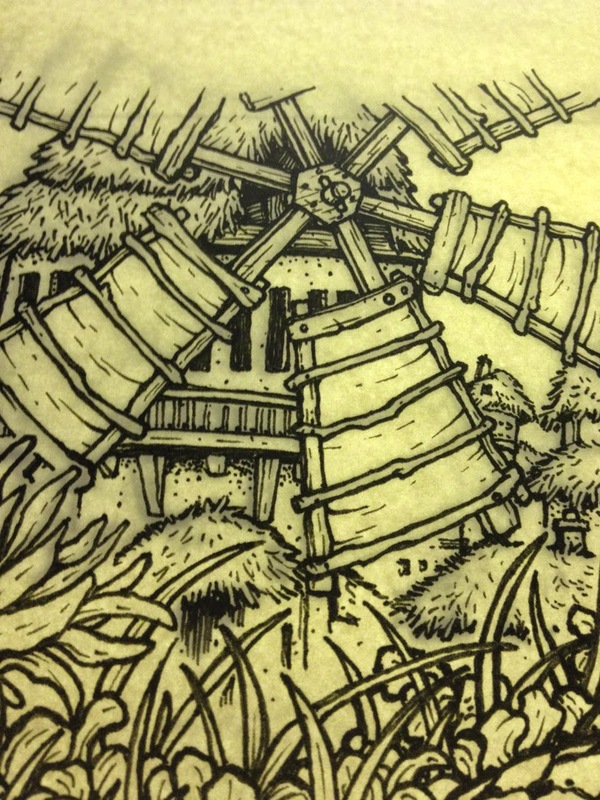 I added a color hold to all the village inkwork to help it recede into the background. I'd already established most of the color palate for this cover back when I did my digital mock-up/composite, so this was just a matter of coloring inside the lines. To render the color and get the shadows, highlights and texture, I use the dodge and burn tools with a textured brush. In areas like the clover (or when I do shingles or a forest floor of sticks) I select groupings of the shapes and then make them darker, lighter, or shift the color compared to a few around it...and I keep doing that until the clover all look a little different and not like they were painted on a computer. Here again is the final cover art sans-logo and border. 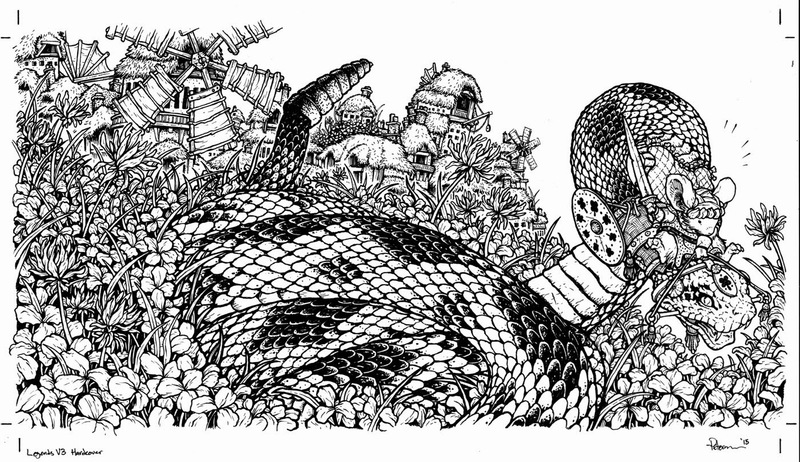 The book is due out this Fall and you can read about the legend of this mouse and snake inside its pages. 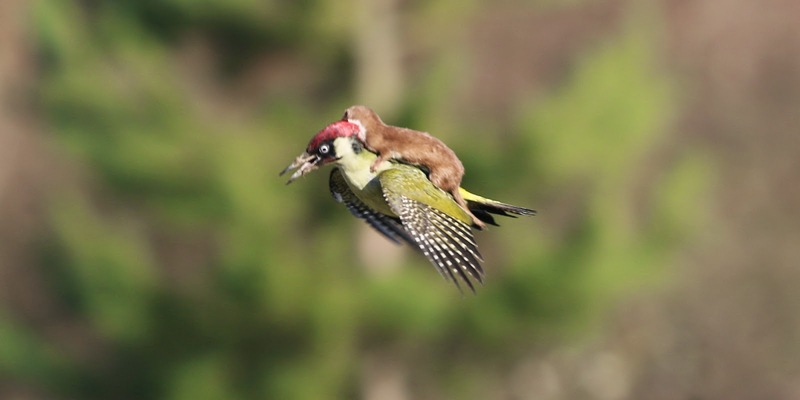 Back in March this photo of a baby weasel 'riding' on a woodpecker in the UK went viral. People shared it, made memes of it, photoshoped people/things in place of either creature...it was a big deal online for a few days. And many many fans sent it my way to make sure I'd seen it. And every time it would come across my digital desk, I'd think "If I had the time, I'd do a drawing of this to have some fun and let everyone know I've seen it". Instead of doing a drawing, I opted to tweet this. But it lead to some fans, who missed my joke, thinking they needed to show me the photo to prove that a drawing like that would be believable. 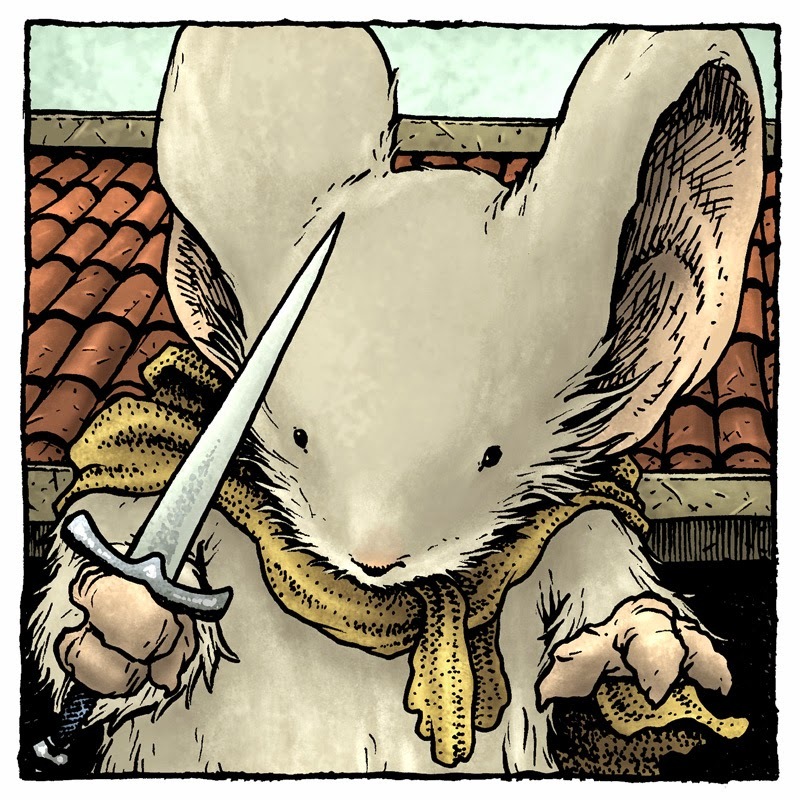 So I pushed aside the work I was supposed to be doing to quickly pay homage to the photo, and have some fun with non-mouse characters who could appear in Mouse Guard (or perhaps a Legends type tale). 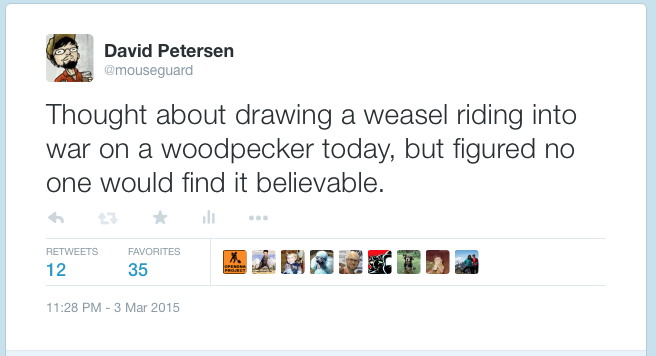 I drew the woodpecker and the weasel on separate sheets of paper, but worked on the weasel while laying that sheet over the woodpecker sheet on the lighbox to help get the scale and pose right for the woodpecker's position. I scanned the pencils in to Photoshop to merge the drawings (though I tinted them to help me see each figure better) and resize it within a border so I could re-use the art later for publishing if I wanted to. 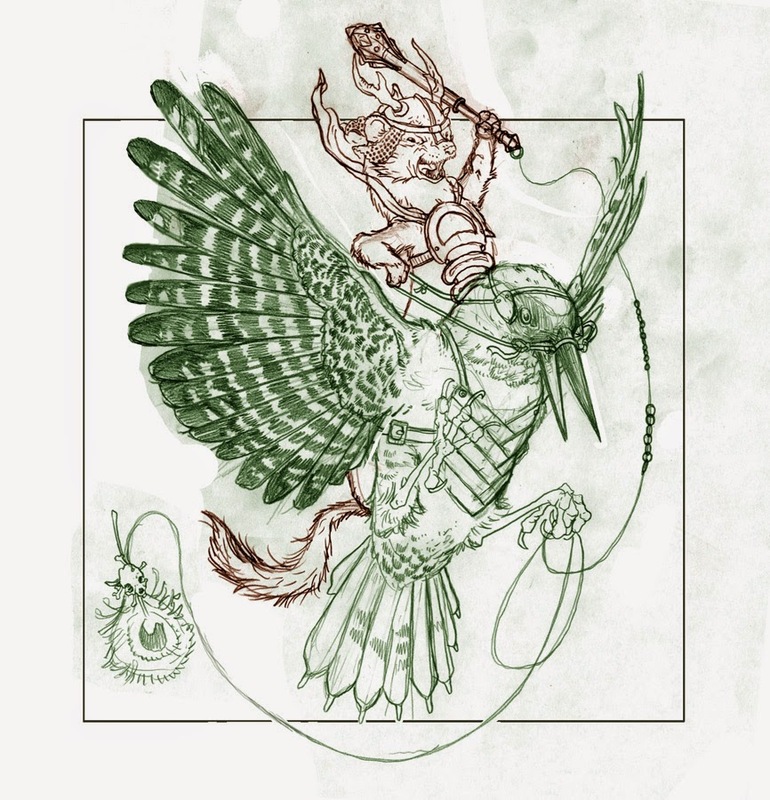 In both the penciling and inking steps I looked at reference for the European Green Woodpecker's feather pattern and markings (as well as anatomy & proportion). I opted to not include any back ground inking texture or marks to let the two figures really tell the story. Lastly I scanned the inks and colored the piece in Photoshop. Most of the rendering and effects were done using the Dodge and Burn tools over base color flats. 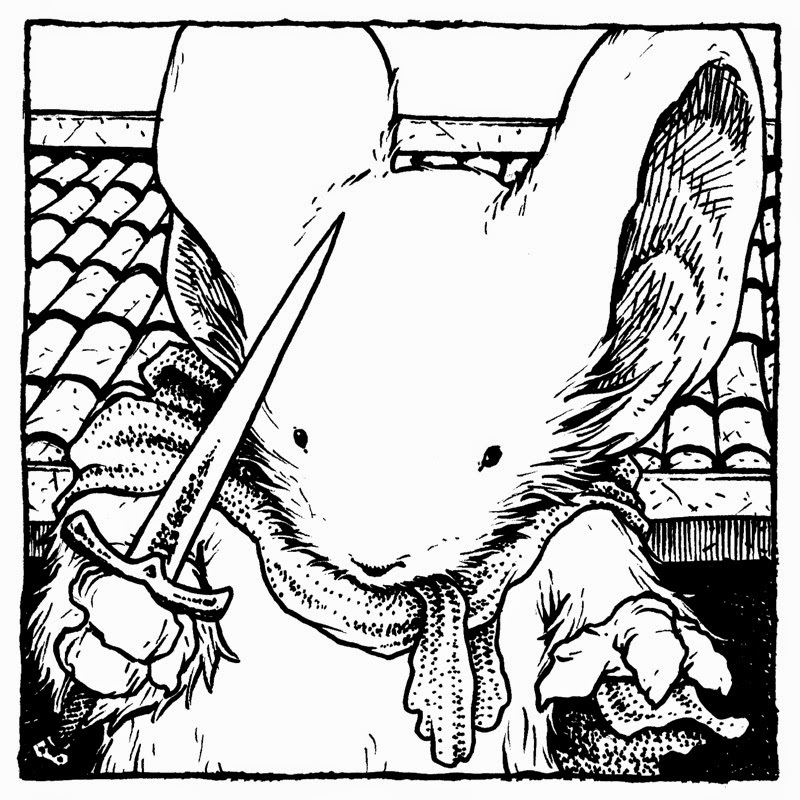 This piece will be appearing in my 2015 Mouse Guard Sketchbook due out in July. 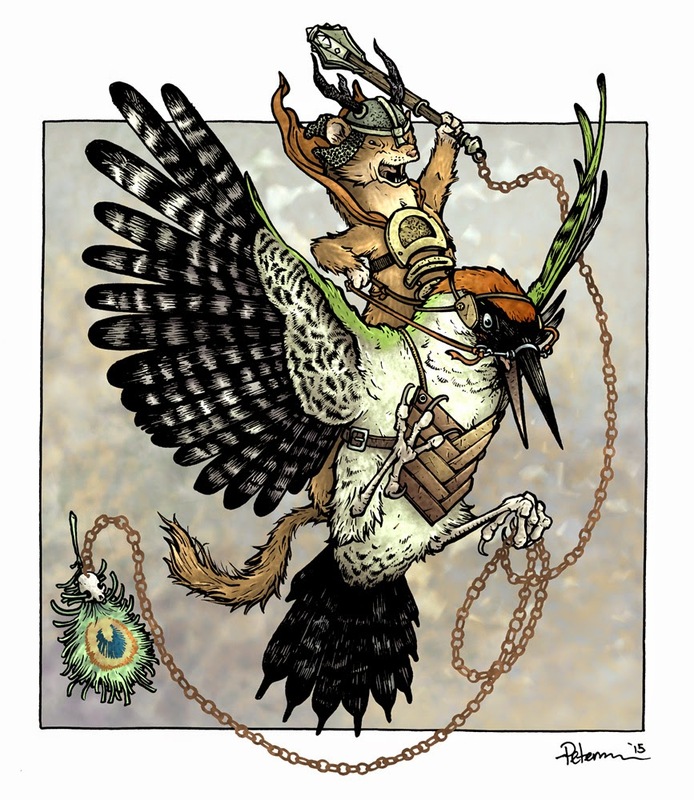 For this year's convention appearances (and for my online store) I created a few new prints. Today I'll be walking through the process of this larger one to the left. It's 11x14. Because I knew the piece wold be one of the larger prints I offered, I decided for it to be a full scene father than just posing characters or a portrait. To the left is the finished artwork, but below is the process steps I took to get there. 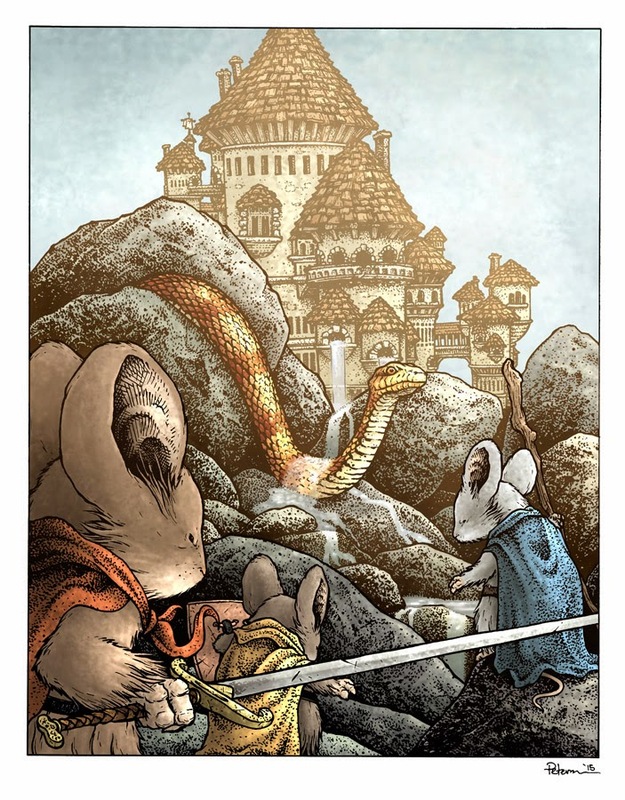 My first idea for this piece was to have mice battling a snake, after all, it is what worked and grabbed people's attention in the first ever issue of Mouse Guard. While researching snake species, I found a photo of a Northern Water Snake going through a trickle of water cascading off some rocks. It was rather subtle, not battle to the death imagery. 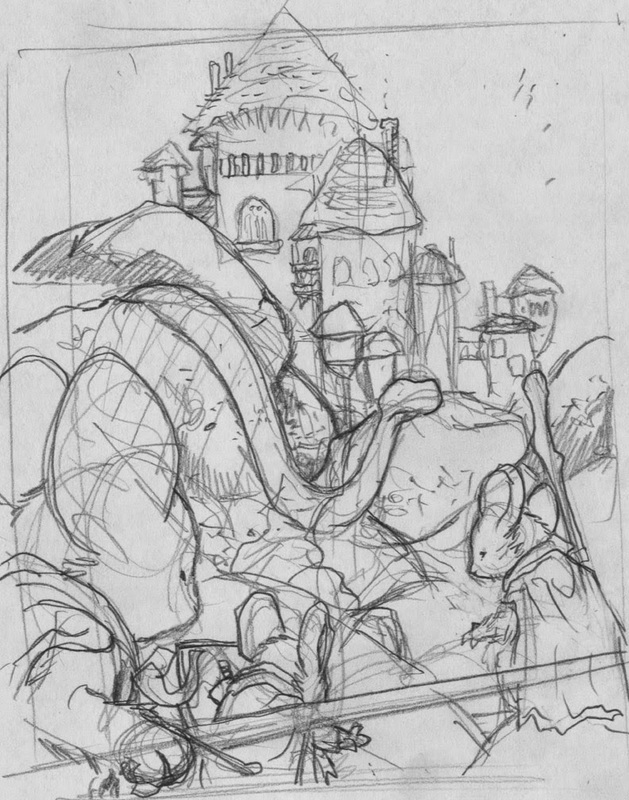 But, I liked the idea of drawing mice approaching/discovering an unaware (but alert) snake on the way to some mouse city. 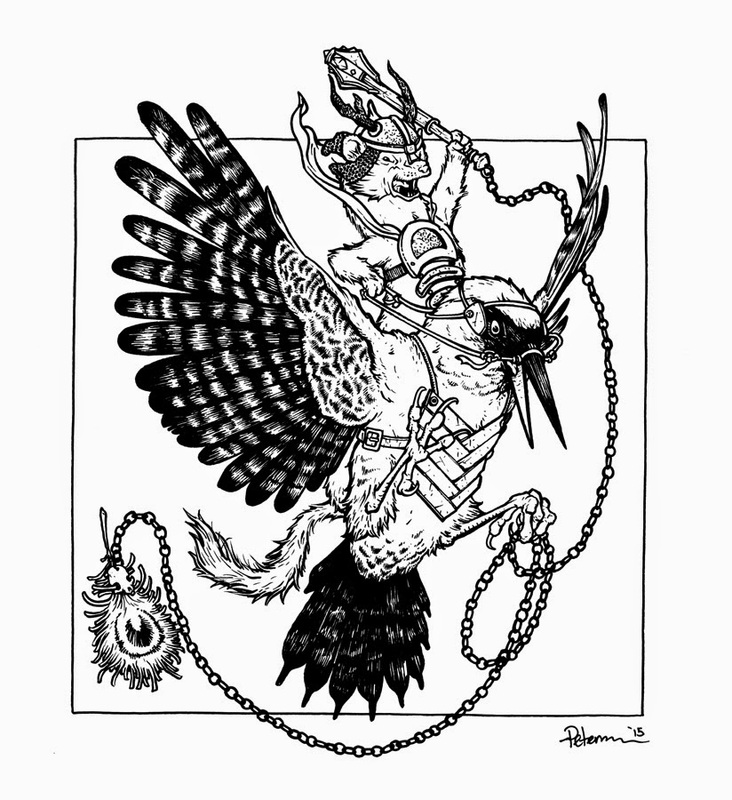 This pencil sketch was drawn at 4" x 5" to get the basics of my concept to paper. As I drew in the mice here, I decided they should be Saxon, Kenzie, and Rand. I scanned that small sketch and in photoshop, enlarged it to the exact size I needed the final art to be and then printed it out. It would all fit on one sheet of paper, so I printed the top and the bottom and then taped them together. 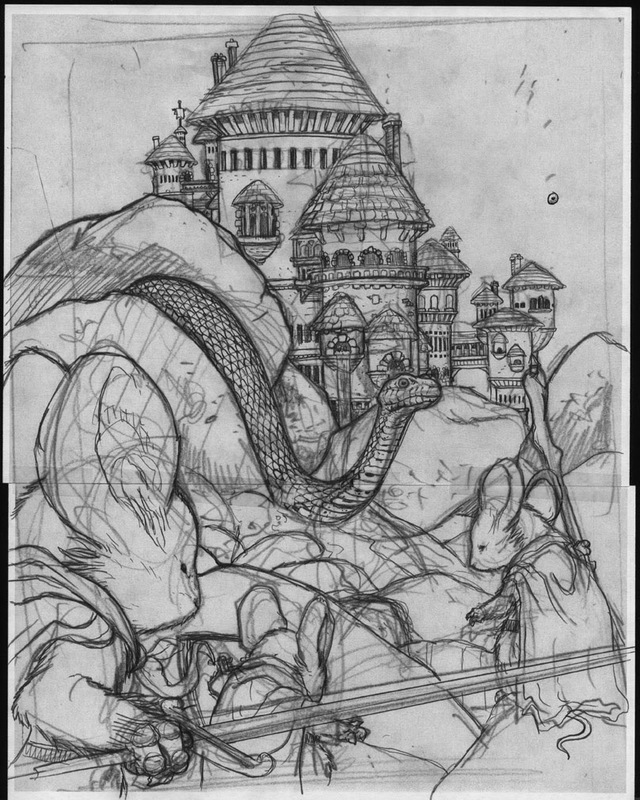 On this printout, I drew over the printed sketch to define the snake and the city as well as to tighten up other details. Sometimes when I do this, I then re-scan the drawn on printout and make other adjustments, but this time, I didn't think I needed to, so I taped the printout to the back of a sheet of Strathmore 300 series bristol to start inking. 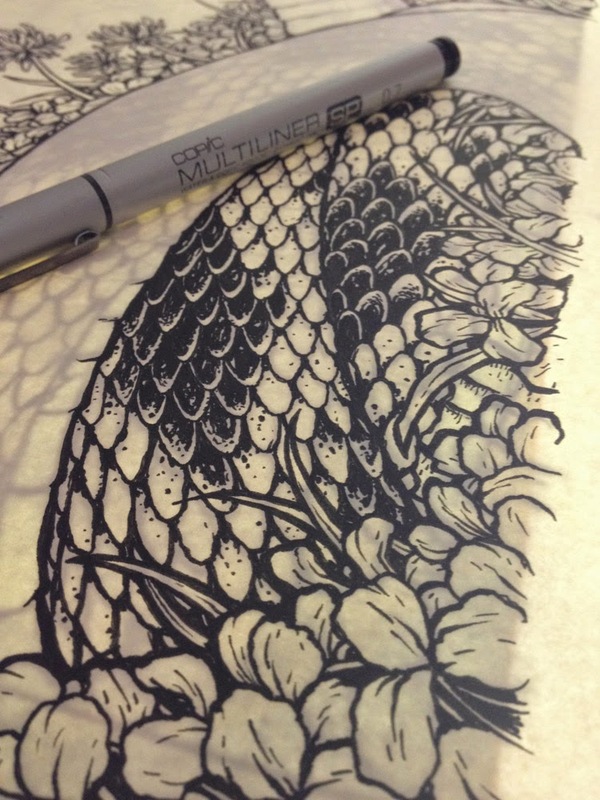 On my lightbox I can see the printout and new pencil lines through the surface of the bristol. This allows me to use the printout as a guide when I ink. For pens, I used Copic Multiliners (the 0.7 & 0.3 nibs mainly). 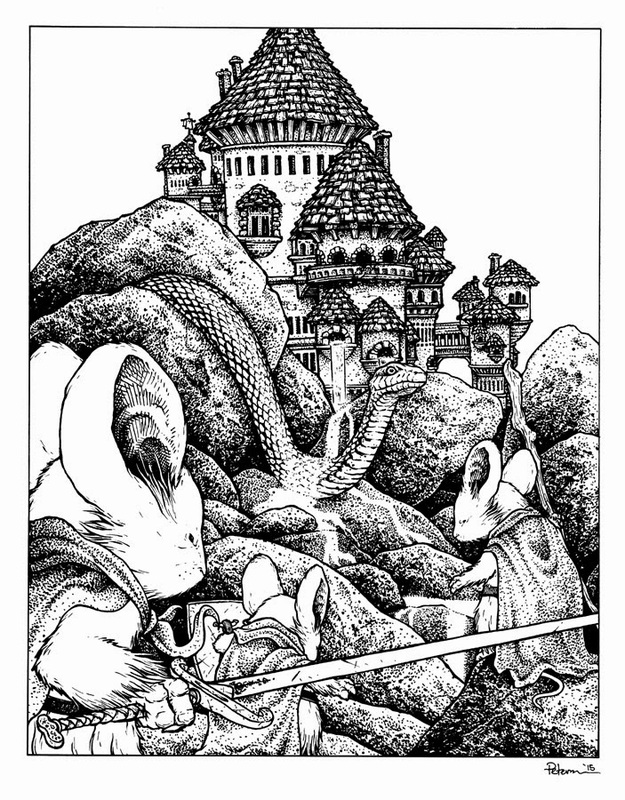 The piece is larger than most Mouse Guard pieces: 11" x 14" and so it took a while to ink in all the value on the rocks and the castle details. Once the inks were finished, I started the coloring process by flatting the piece in Photoshop. 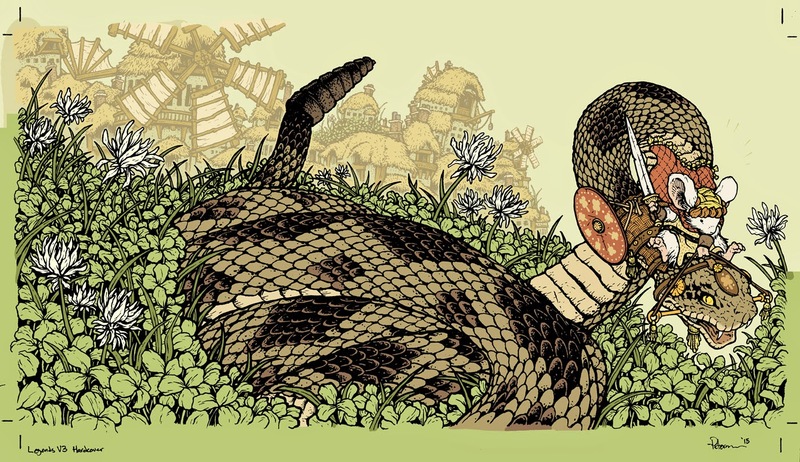 Flatting is the part of coloring where you establish the areas of color. No rendering, lighting effects, or textures are being used or considered, this is just to make the fur a different color than the cloaks, which is different from their skin, which is different from...etc. Then the final stage of coloring was to add in all those things you avoid while flatting: texture, light source, shadow, color holds and effects, etc. To the right you can see the finished image. 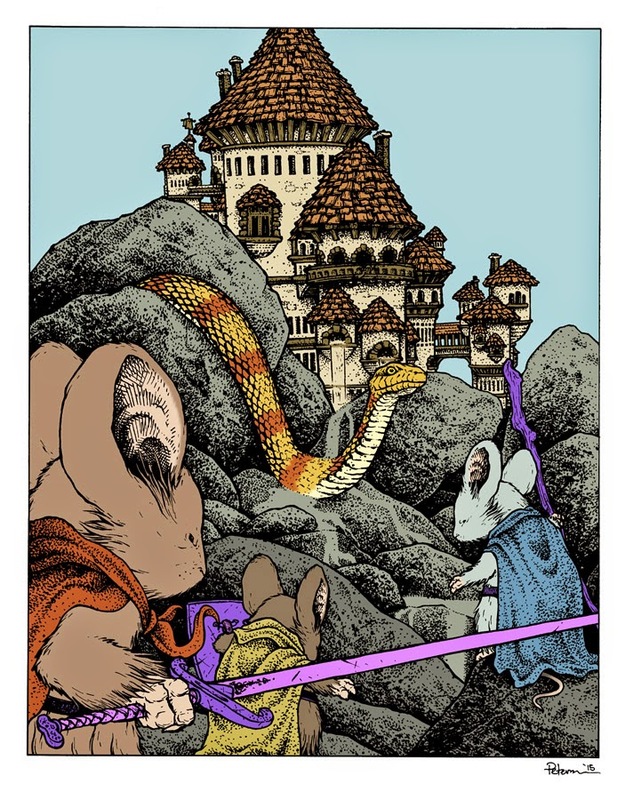 I thought the image lacked depth when just colored, so I added color holds and some effects to give 3 levels of depth: the foreground mice, the midground snake, and the background castle. This print will be available at my convention appearances and in my online store soon.